This is a Twitter network for a political hashtag in the US, produced by Truthy. We see two clearly separated clusters, corresponding to conservative and liberal communities. 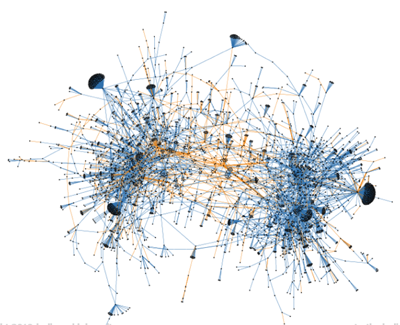 Retweets, which tend to stay in the same community, are shown in blue. Mentions, shown in orange, connect the two communities. Image © Truthy. Networks loomed large at the AAAS annual meeting in Vancouver, in particular the one you're looking at right now: the Internet. Plus went along to a session on web surveillance. It sounds sinister, but as we found out, it's not all about Big Brother breaching your privacy. Information on the web can help us catch terrorists and criminals and it can also identify a practice called astroturfing — creating the false impression that there's huge grassroots support for some cause or person using false user accounts. It's a big problem in elections and other types of political conflicts. We spoke to Hsinchun Chen from the University of Arizona, who is involved with the dark web terrorism research project which develops automated tools to collect and analyse terrorist content from the Internet. We also spoke to Filippo Menczer from Indiana University about Truthy, a free tool for analysing how information spreads on Twitter that has been useful in spotting astroturfing.